Running cadence. Wondering how to get faster? Anne Marie lets us in on her best kept secret: running cadence and how it can increase your running speed. Hi there! My name is Anne Marie, and I'm a SAHM of 3 ½ yr old twins. I'm also a part time ACE certified personal trainer, a USAT certified triathlon coach, and a fit model for the clothing company Athleta. This is a different life than I had five years ago. I would have never tagged me as a runner, but I am and love it! That's it. Most runners have a stride rate of ~85 strides a minute, and that will do you well. But the big marathon winners have a rate of 110 rpm- just fyi...that's quick! So make a goal to have your strides hit somewhere between 90-95 rpm. On your next run focus only on your cadence. Don't worry about intervals, speed, heart rate, power, whatever. Also, don't wear your music because it'll distract you from your strides. Time yourself for 30 seconds by counting your left (or right) foot as it hits the ground as 0, then your next left footstep as 1, and so on. 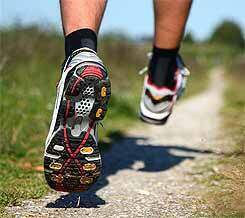 Multiply the final number (how many times 1 foot hits the ground in 30 sec) by 2 for your current stride rate. Then consciously think about having quicker, smaller, steps to get it up to 90. Time yourself every few minutes to see if you're increasing the rate. I have to tell you, it feels pretty funny at first. You'll feel like you're doing something wrong, but you're not. It also takes time. It took me a good two months of focusing purely on cadence to feel more natural now at ~92-95 rpm. And I'm seeing results. I had a PR 10k this past weekend, averaging a 7'08 min/mile and it's my 'off' season! So, I'm looking forward to adding intervals and speed work in 2010 and seeing what happens. Now go on out and start counting! And I'd love to hear how it goes. You can stop by my blog at www.goalsfortheweek.